I was having trouble working out what to write for this one - kept descending into hyperbole - so I just copied this from the Line of Best Fit: " Canadian dream-pop stalwart Miracle Fortress is heading over to Europe next month for a string of shows in support of the wonderful Was I The Wave? long-player from earlier this spring. 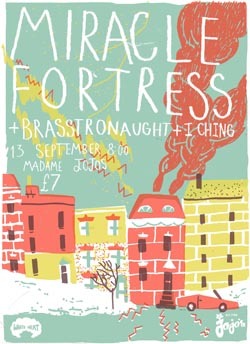 The eleven date tour takes in a headlining show at London’s White Heat which also features a strong supporting cast of Brasstronaut and I Ching."